If beef exports were the Super Bowl, Australia would be beating team America to the ‘touch-down’. Last year, the United States lost $100 million worth of beef sales to Japan, after Australia muscled in following its signing of a free trade agreement, according to figures cited by Meat and Livestock Australia. But Australian beef processors are getting strangled by tightening cattle supply, higher prices at home, and a fall in international beef prices. Australia’s record breaking beef exports to the US have come to an end, with figures from the Australian Department of Agriculture showing during January exports were 57 per cent lower than December, which were 34 per cent down on November exports. Meat and Livestock Australia’s international manager for North America, David Pietsch, said beef and livestock prices had boomed a couple of years ago. “[Now] they have fallen quite sharply, that does have an impact on Australian exporters,” Mr Pietsch said. “But the full impact has been mitigated by the falling Australian dollar. Exporter David Foote, from Australian Country Choice, said all markets for his product were falling away, including Japan. “Exports for us have gone real bad, especially in the last six weeks,” Mr Foote told the ABC Landline program this month. “We’re out there selling five days a week and it’s tough. Figures from the Department of Agriculture show Australia’s beef exports to Japan for January are down 47 per cent on the previous month. Exporter Sanger says the depressed market in Japan is because they have built up beef supplies, cheaper beef is arriving from the US, and Japanese buyers are holding off until a further tariff reduction for Australian beef in April reduces the price by two per cent on chilled product, and one per cent on frozen beef. Japan is the world’s biggest meat importer, taking 22 per cent of Australia’s beef exports, and is Australia’s single biggest market for grain-fed beef. 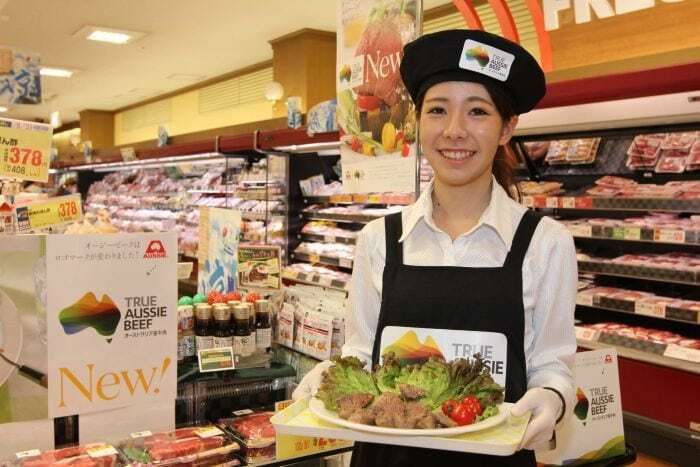 Meat and Livestock Australia’s international manager for Japan, Andrew Cox, said Australia had to fight to defend its market share against the US in Japan, as well as against cheaper protein sources, like pork. Mr Cox said tariff cuts, under the free trade deal, were helping Australian meat products remain competitive. “On April 1 we’ll receive our third tariff cut,” Mr Cox said. “That means Australian beef has a lower tax than American beef. “There’s a buzz about Australian beef because Japanese people like a deal. “But I’ve sighted economic estimates out of the US, that estimate $100 million worth of sales has gone from US to Australia. Meat and Livestock Australia (MLA) figures show the average Japanese person eats six kilograms of beef per year, but ageing Japanese consumers, dubbed ‘Silvers’, are looking for smaller portions of leaner meat. The definition of lean meat in Japan is about five score of fat, which Australians might consider to be fatty. Mr Cox said MLA had tapped into another trend for barbeques in Japan, with a fun advertisement showing a caveman dropping in on a family BBQ on the beach. “Beef or grilled meat has always brought people together since the early days of civilisation,” Mr Cox said. MLA figures suggest average beef consumption in the United States is 24 kilograms per year, a figure which has been declining for some years. While grinding or manufacturing beef for hamburgers has been the major market in the United States, the niche for grass-fed beef is growing among consumers willing to pay a five per cent premium or more for free range, organic, or antibiotic free product. Mr Pietsch, MLA’s international manager for North America, said he had a ready answer for consumers concerned about the vast food miles of meat coming from Australia. “We demonstrate through our research on life cycle assessment that we can produce grass-fed beef and distribute that and have a low environmental impact,” he said.